In a sea of expo stands and exhibitors it’s sometimes forgotten that you need to attract people to you, from afar. 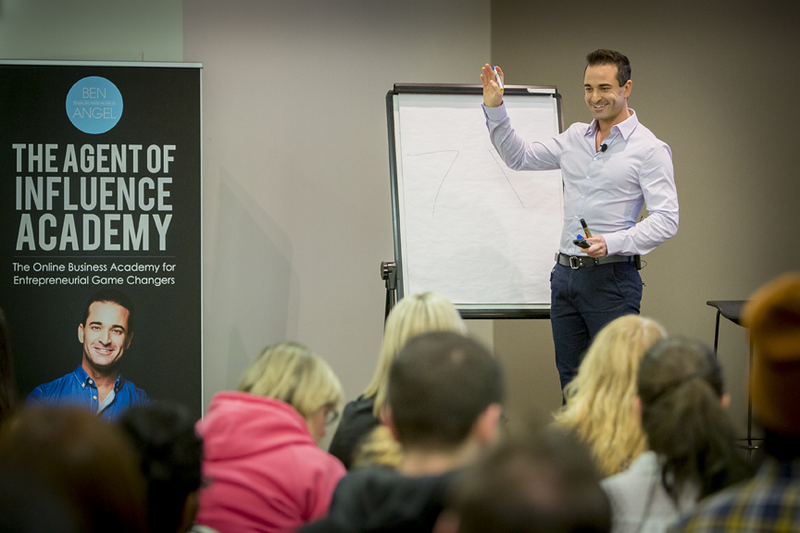 Attracting prospects to you and not your competitors is the first step to having a conversation and building a relationship. So, they first need to see you, then come to you. And this is the sole role of your Pull-Up Banner: to be the beacon that catches the eye of the right people and draws them to your stand. But, this requires your Pull-Up Banner to be designed right for this job. 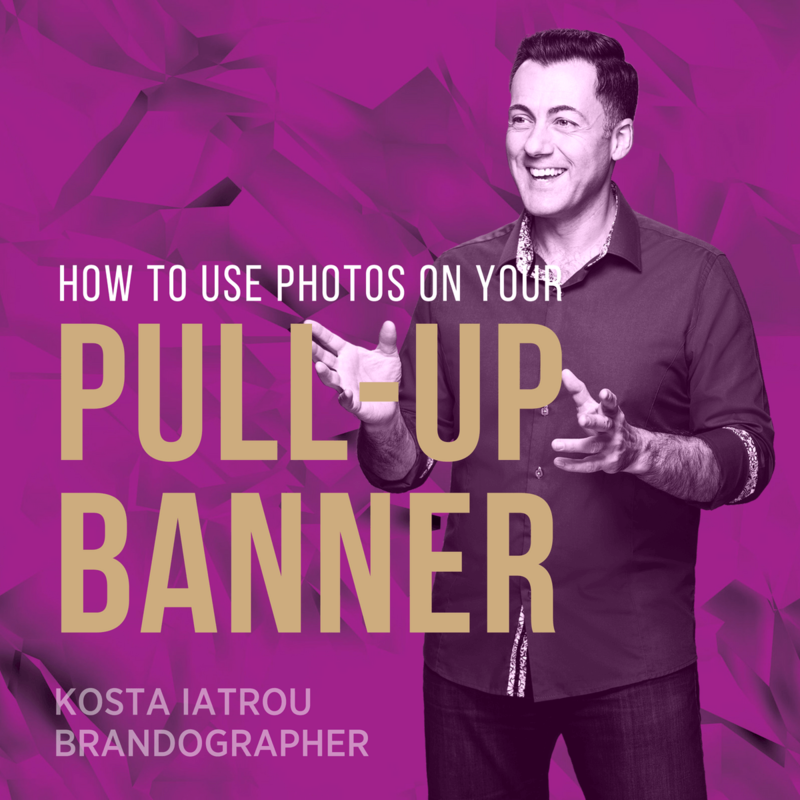 So here are our top 6 tips to make your Pull-Up Banner, remarkable. 1. 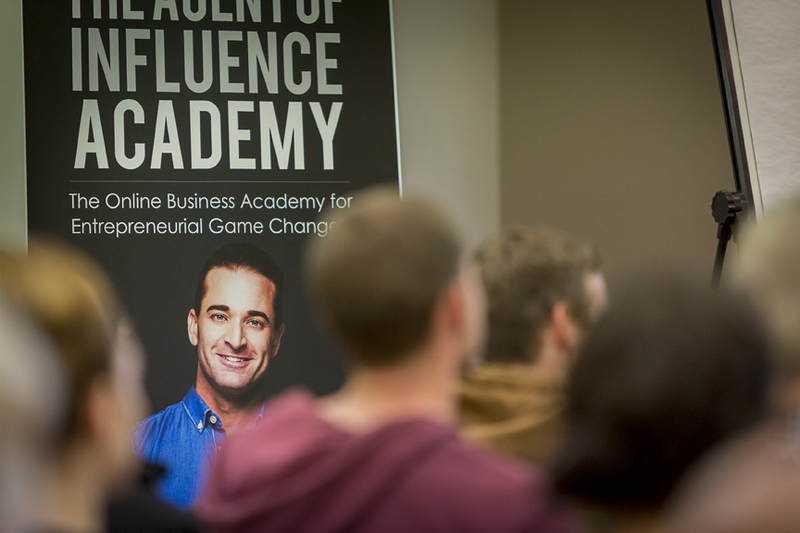 As an Entrepreneur wanting to build your Personal Brand you should be using a great portrait of yourself that is relevant, shows your personality and positions you as the leader and authority in your field. If you are using photos that are out of date (over 2 yrs) you are sending a confused message to your audience which only serves to damage your brand and make you look cheap. And no one wants that! 2. Keep the overall design simple, remember it’s a beacon to attract people to your stand, it’s not meant to be plastered with everything you want to say. More information is what flyers, brochures, websites, etc are for. So pick one message for your banner to convey. And the fastest and easiest way to convey a message is with a photo, an image or graphic that’s relevant and specific to your message. 3. 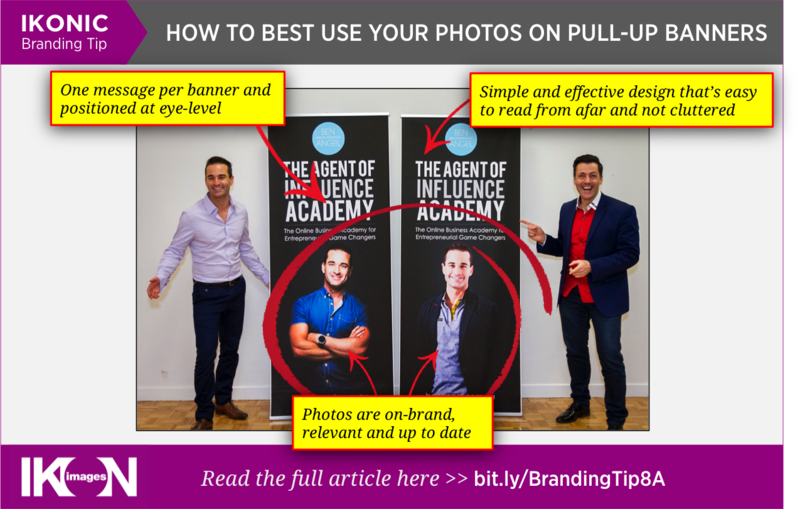 A banner using a single photo needs to be created during your Photo Shoot, with this purpose in mind, and then positioned in a portrait format for maximum impact. A banner with multiple images allows you to use portrait and landscape formatted photos but remember that they need to be big enough to be seen from afar. 4. Photos need to be at a high resolution and suitable for offset printing. This requires photos to have a resolution of 300dpi, prepared as a CMYK file, saved in loss-less format (like TIFF or PSD) and big enough so when it’s enlarged it won’t get pixelate and look amateurish. This means a photo sized to at least 12″ x 18″ (3600 x 5400 pixels). This gives your designer the ability to resize it up to use the whole banner if needed. 5. A good design will have your logo at the top with a slogan or tagline, otherwise know as your brand promise. Easily viewable and read at eye level (this is where the attention-grabbing information is placed, like a great photograph) and set up to be read from top to bottom and from left to right. And at the base of your banner you’ll include your contact details which need to be clear and easy to find. So think logo/tagline/one message – text and photo(s)/contact details. And remember to keep the colours and fonts on-brand. 6. Pull-Up Banners are priced between $100-$300 depending on the quality of the fabric and the mechanics. But the images you use and the design created are what’s going to be most impactful. This is where you need to make an investment to get the right look and send the right message to your prospects. The photos for your Pull-Up Banner need to be designed for the banner, clear and large, prepared for offset printing and created so they position you as an authority and professional in your market. 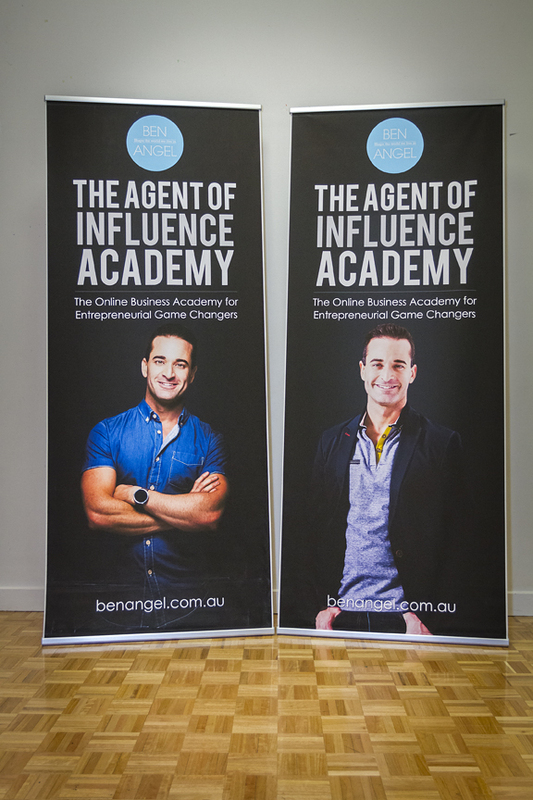 So why are Ben Angel’s Pull-Up Banners so good? It’s simple. He’s implemented simplicity in his design. Have a look at the structure. From the top down it’s: Logo, Title, Subtitle, LARGE PHOTO and Website. There is ‘no war in peace’ to read here so you can see Ben’s pull-up banners from across the room, clearly and without clutter. Remember pull-up banners are meant to attract your prospects to your stand or stall [in an expo environment] so think of them as large magnets to bring in your prospects.